The final question; Why did you start blogging and what is the meaning behind your blog name? 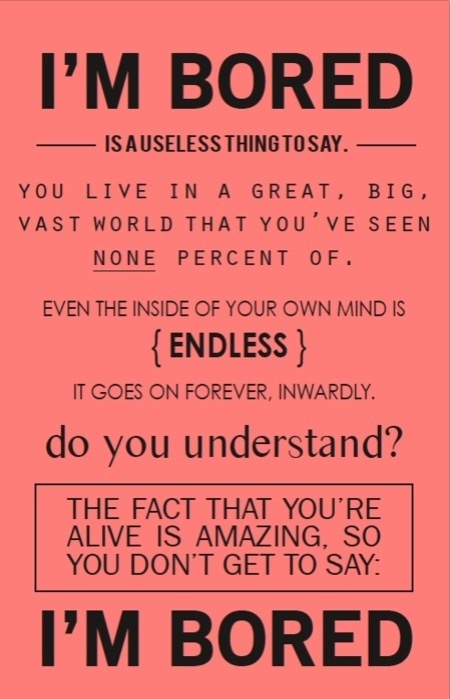 Thanks Louis C. K. for articulating my thoughts and feelings. In 2009 I had been living in a new city and had started to a new job and been living all alone and away from all my friends and family. I was missing them so I wasn’t looking forward to mingle or socialize in this new city. As an introvert, I was totally happy all alone there. People kept asking me “Oh aren’t you bored? It must be boring being all alone…” I was trying to explain these people by saying, “No, I’m totally OK with it, I love being alone and what you call boredom is my happiness so you know, sometimes boredom is fun for some people“. Today my scientifique answer for them is “I’m making my own energy from within and not deriving it like you from other people so I don’t need people around me as you do (which, both conditions are totally normal and acceptable).